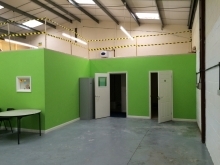 Access is provided by personnel doors and steel roller shutter loading doors. There are car parking and loading areas to the front of each unit. Local and national occupiers in the area include Screwfix, Motorcare, Plumb Centre, Heronhurst Window and Door Centre, James Lister & Sons, ATS, Aldi, Worcester Electrical Distributors and Flo Screed UK.